Successfully Added Car Rearview Mirror Monitor + MP3/MP4 Player to your Shopping Cart. This might be the most important car accessory ever invented. The CVTM-C94 keeps you safe as well as safely entertainment by being a superb wide angle car rearview mirror monitor with amazing media player functionality! Yet for many years, the number one consumer complaint regarding rearview mirror monitors was the inconvenience of having to attach a separate media player in order to get entertainment value out of the LCD monitor. We listened to your feedback and designed the CVTM-C94 to be a first class rearview mirror monitor with a top of the line media player inside. A media player that plays media files directly off yor SD card and USB flash drive and can easily play today's hottest audio and video file types like: MP3, MP4, XVID, DIVX, MPEG 1, MPEG 2, MPEG 4, MOV, RM, and much much more! This is why the C94 is so awesome! It easily clip-mounts over your existing rearview mirror. It's wide angled to enhance your rear view. It comes with a power line you can easily tuck behind your dashboard and connect directly with your car battery. It also has a separate extra long FM transmission antenna for better pairing with your FM radio. Consumers often complain about the audio quality when using FM transmission so we did something about it by developing an extra long pliable FM antenna to work with the unit. This means that when you tune your FM radio to 87.7, whatever is playing on this device will be beautifully broadcast through your car speakers. There's more. This product accepts two video inputs so you could monitor two rearview cameras...one for each side of your car. Is this a car DVD player alternative? Maybe. While today's in-dash car DVD players pack a lot of power with WIFI, 3G, GPS and region free disk play, most come with a 7 inch screen. This rearview mirror monitor has a 7 inch screen as well making it ideal for those car enthusiasts who want to add audio video entertainment to their ride without a lot of installation hassle or extra cost. Sure you don't get GPS, but for many drivers that's not a big deal. Drive safe. Have fun. 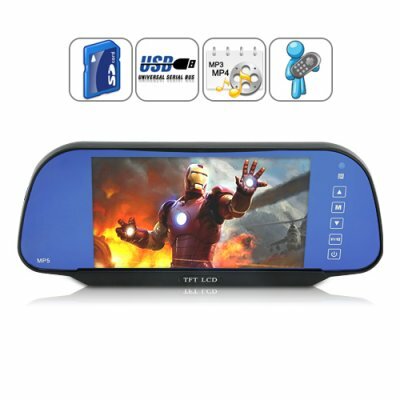 And hit that add to cart button right away...and in a couple of days you'll be the proud owner of this wonderful rearview mirror monitor media player. Better yet, resell it on your online store before your competitors do. This is a first of its kind and we're expecting strong sales with this one. The early bird as they say gets the money...brought to you by Chinavasion. Accepts one or two video inputs such as a rearview camera or gaming system. Comes with adjustable bracket clips to easily mount over your existing rearview mirror. Onboard control or remote control access.